The primary goal of the dairy industry is to ensure the quality of the milk produced. Furthermore, quality levels must be constantly guaranteed and improved. This is achieved by verifying that milk is safe in terms of hygiene and health (microbiological safety, absence of environmental micro-pollutants, etc. ), genuineness (non sophisticated) and nutritional value. Several indexes, like furosine and lactlulose, are used to assess whether powder milk has been added to raw or pasteurised milk. Given the cost of these determination methods, we focused our attention on the development of fast methods that could be used during the production stage and in non-dedicated laboratories and that could produce results similar to those of the reference methods. 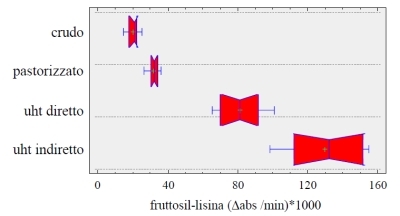 For this purpose, the central laboratory of PARMALAT S.p.A. conducted a study aimed at assessing the reliability and applicability of the ε-fructosyl-lysine test made available by CDR. The results of the study were presented during the 2002 edition of Congrilait in Paris. Said results confirm that this method provides the same information of the furosine method. The study performed in the central laboratory of PARMALAT S.p.A, aimed at assessing the effectiveness of CDR’s analytical method to differentiate the thermal processes, was described in the poster presented during the CISET 2003 conference. CDR FoodLab® Method and the assessment of Milk Thermal Processing was last modified: May 3rd, 2017 by CDR s.r.l.